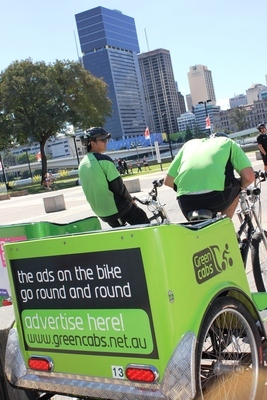 As the name, Green Cabs suggests, these pedicabs are an environmentally friendly form of inner city transport, using nothing but man power. They are also the most entertaining way to become familiar with the city - day or night- without getting lost or exhausted. 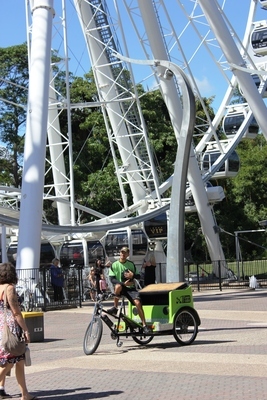 Green Cabs are based at The Big Wheel, and run tours of Southbank and surrounds from around $15. Children under 8 years of age ride free. Anyone enjoying a Green Cab ride is entitled to a 2 for 1 deal at The Big Wheel - a saving of $15. Cycle Rickshaws or Pedicabs have been widely used in South East Asia for centuries under names like Ricksha (Bangladesh), Cyclo (Cambodia), Sanlunche (China), Becak (Indonesia), Beca (Malaysia), Trisikad (Phillipines), Trishaw (Singapore). They are such a clever way to by-pass inner city traffic and guaranteed to bring a smile. 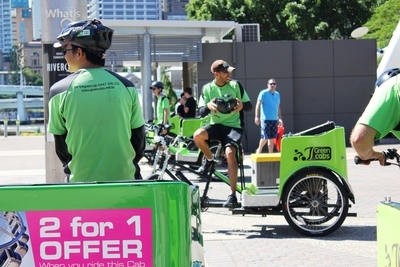 So next time you need to hike across town, why not experience first hand (or leg) the modern cycle rickshaw right here in Brisbane?